presence of large amounts of radioactive iodine (March 2011). We need your support to tell this story! 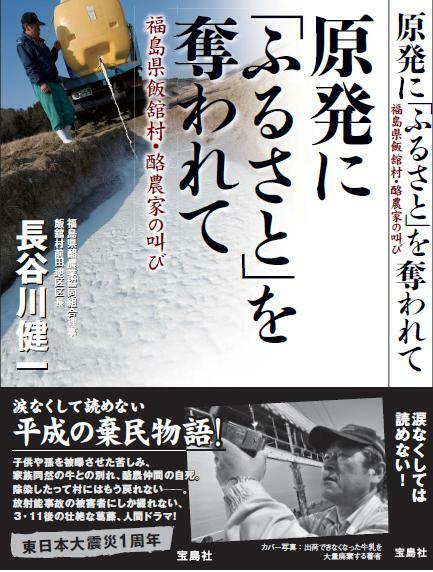 In this personal account, published in Japan in 2012, dairy farmer and author Kenichi Hasegawa describes how most of the people—including very young children— in his village (known as Iitate) continued to live in their homes for more than two months following the Fukushima Daiichi Nuclear Power Plant accident that occurred on March 11, 2011. Iitate’s residents were unnecessarily exposed to large amounts of radiation simply because the Japanese government did not make information about the leakage of radioactive materials known to the public. Hasegawa, who was himself exposed to large amounts of radiation, describes the 3/11 catastrophe and its consequences in simple, direct, and clear prose, and in a way that could only be told by someone who lived through it. Weaving together various stories about the experiences of Iitate’s residents, Hasegawa is a witness to the truth of what life was like immediately following the accident—as he suffered with the knowledge that his children and grandchildren had been exposed to radiation, as he lost all of his cattle (who were considered part of the family, not simply the source of their livelihood), and as he endured the suicide of a fellow dairy farmer and friend. Written in the form of field reports (reportage), Hasegawa recorded these experiences following the nuclear accident not only for the sake of documenting the truth of the past, but also in an effort to create a more hopeful future. After the publication of Hasegawa’s book in Japanese, we heard from people all over the world—concerned citizens, lawyers, journalists, educators, and others—who asked that these valuable reports be made available to a wider audience. This was the impetus for our plan to produce an English translation. Late 2015: E-book completed. Begin sales on amazon.com and other retailers. Total production costs: 1.8 million yen (translation: ¥1 million; e-book production: ¥800,000). All backers who contribute 1000 Japanese yen (approximately $10) or more will receive one complimentary copy of the e-book, provided that that the total fundraising goal (¥1.8 million) is met and the project is implemented. Please indicate your preferred e-book platform (Amazon Kindle or Apple iBooks). For more information, please contact Shojiro Akashi at Reportage Laboratory Co., Ltd.
* Schedule may vary slightly. * Please make inquiries in English or Japanese.